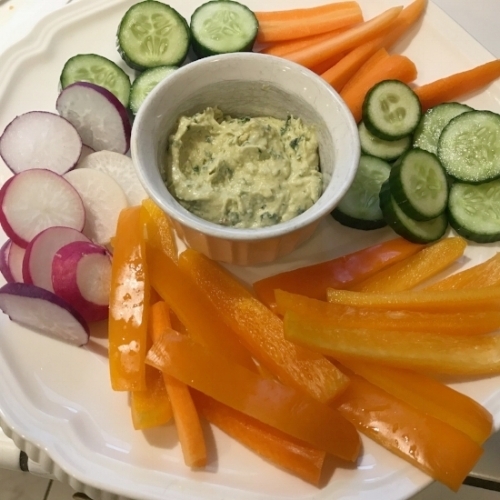 I was making dinner the other night and didn't feel like roasting vegetables and didn't want to make a salad either so I decided to make a veggie tray to serve with dinner. 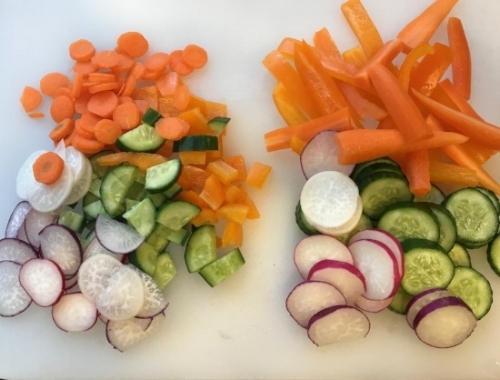 Chopping extra veggies for a salad makes a lot of sense and saves time for the next day. You can certainly prep more food than enough for just one extra day, but you get the idea. 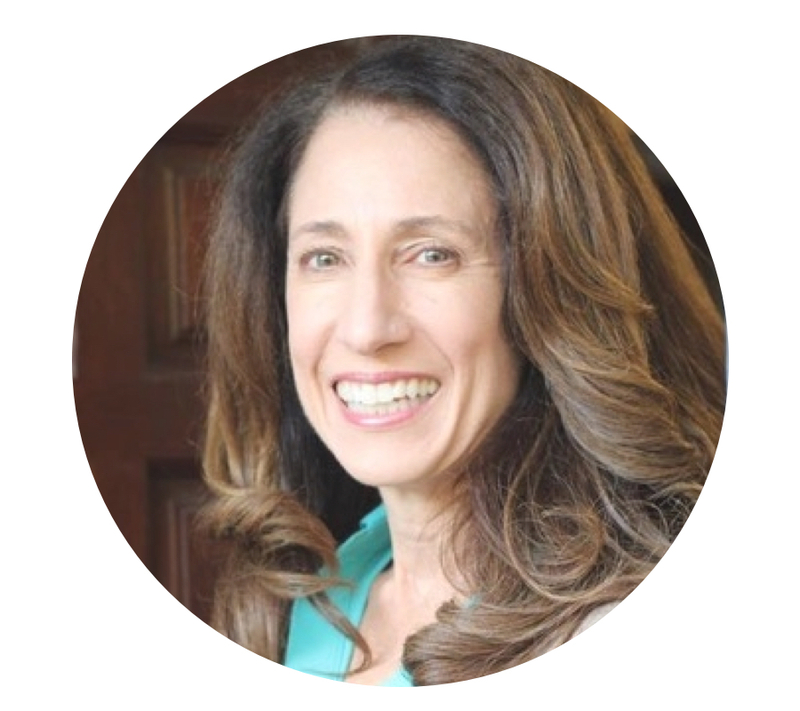 Here is an article from Cooking Light magazine for more tips on meal prep. Pre chopped vegetables are best used within a couple days, not for the whole week. Carrot, Orange Bell Pepper, Radishes and Persian Cucumbers. The veggies felt way more special with the hummus I picked up from the Westlake Village Farmers Market on Sunday. I LOVE this Kale Almond hummus from the Moms Products Hummus stand. Check them out if you are a local! 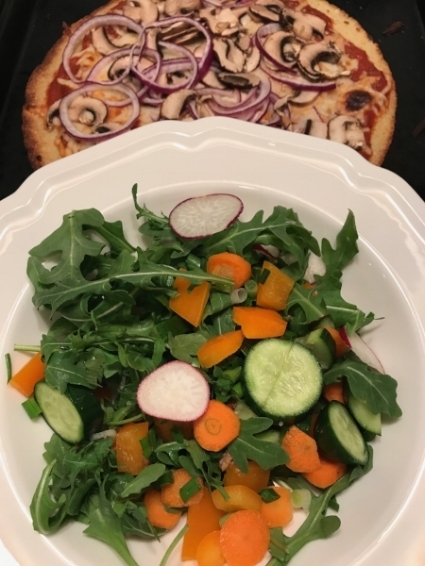 My arugula salad the next night with mushroom, red onion pizza on Trader Joes Cauliflower crust. YUM! I have shared other recipes on my Pinterest page that work well with the Chop Once, Eat Twice theme. 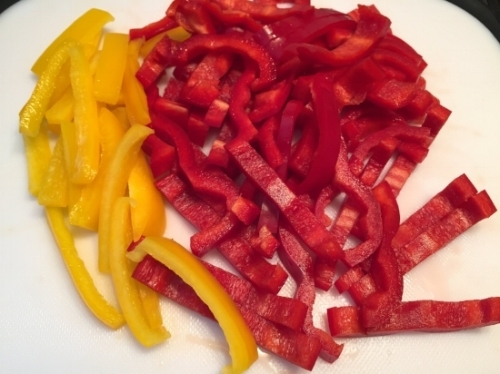 Red, yellow, and orange peppers can be Italian one night and Mexican the next! It can also be as simple as making extra roasted vegetables to enjoy at dinner one night and then thrown into a salad or a wrap the next day, or making extra brown rice or quinoa to use for a few days. Soup is a great way to eat several times from one chopping day! Giada's Roman Style Chicken, go heavy on the veggies by doubling the peppers and tomatoes. Take good care! Have a Wonderful Weekend!